I managed to get some sleep last night…until another big rumble around 1:45am. Right after the shaking, I heard Francisca’s door open and I got up to check on her. We decided to venture out and walk up the hill to see if anything was visible on Agung. We walked up the hill and into the Sunset Point sitting area, but was greeted by the guard dog. The barking started and we knew we weren’t going to be able to sit at the top of the hill. So we decided to walk along the beach instead. We found a point that had a perfect view of Agung. 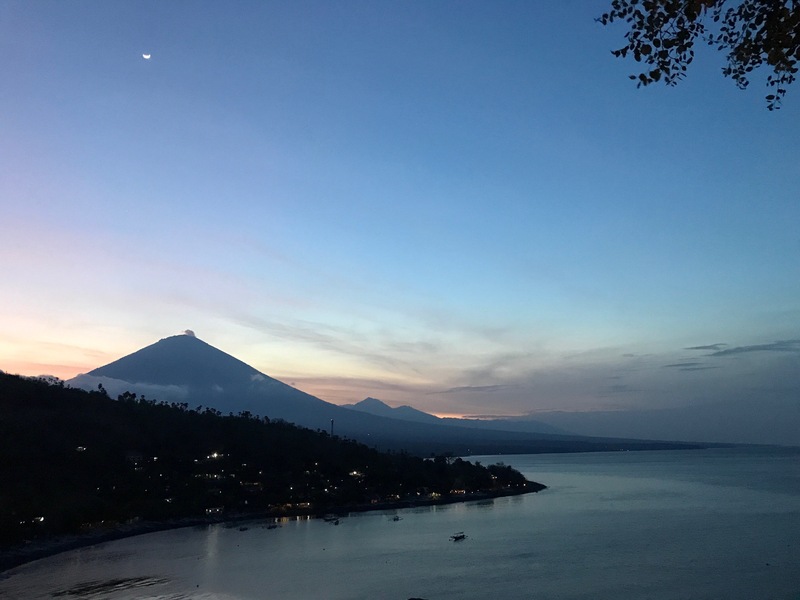 The night sky was black and the silhouette of Agung was a shade darker. We could see a haze that appeared to be smoke, but we weren’t too sure. So we sat down and just…watched. We weren’t anticipating anything, we just felt safer on the beach than in our rooms. And, to be honest, we were damn curious, like everyone else on the island is. I’ve seen a lot of people with their cameras set up just in case she blows. Sunset Point was packed last night and nobody’s eyes really strayed from the volcano. No one seemed afraid, thankfully. It was quite beautiful. So there we were, laying on the beach at 3 in the morning. It may have been the most peaceful couple of hours I’ve had while here. I was laying on a bunch of stones and using my backpack as my pillow, but I was so comfortable and I felt safe with Francisca by my side. We were silent for almost two hours and I used the time and the sound of the waves to meditate. It’s wild what your mental path is when you’re in paradise and there is a threat of a volcanic eruption. I still feel safe and am truly enjoying the stillness that follows each rumble. The sun slowly started coming up and we could see the fishermen going out to sea. We walked back along the beach and decided to sit some more and watch the sunrise. Why not? I haven’t left the warung today because there’s a different energy today. Even less snorkelers and people lounging on the beach. I’ve spent the day reading, snorkeling, and spending time with the folks at the warung. In the book I’m reading currently, there was a passage that really stood out to me. It reminded me of the cairn that I had built this morning. 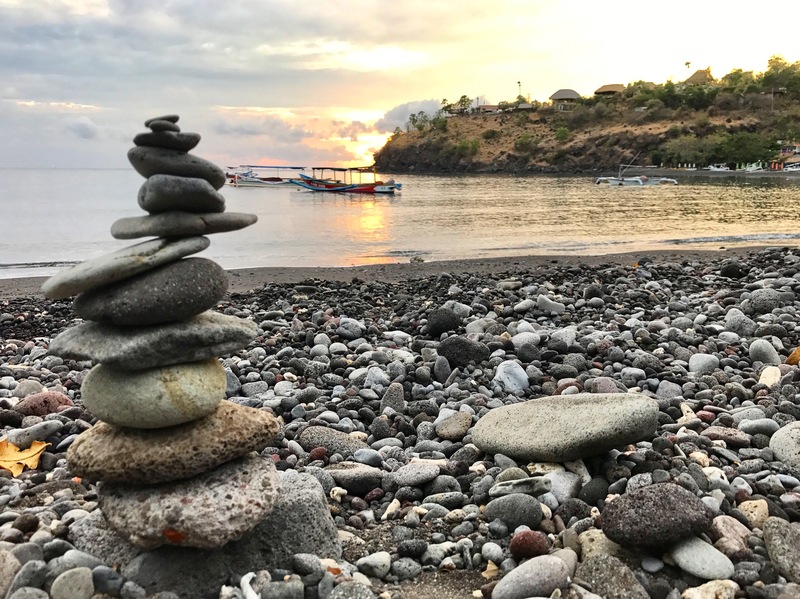 It talks about the process of awakening/enlightenment (yeah, it’s a pretty intense book, but I knew I had to bring a deep read if I’m going to be living in Bali!!). One aspect of the process lays the foundation for the building of a solid concept upon which to base one’s newfound awareness. Much as when constructing a building, the ground must be cleared, old structures must be removed, carted away, and the area smoothed over to make preparation for a new structure that will stand fresh and firmly constructed in its place. The new structure does not emerge in its entirety on day one. But is formed, brick by brick, layer after layer, each level dependent upon the solidity, or lack thereof, of the layer upon which it rests. If care is taken with every stage of the new construction, the resulting structure has an excellent chance of standing and serving the purpose for which it was intended. As I was reading that passage, I was envisioning my cairn. I also thought of my process of getting to Bali. You know how you go on vacation and the day or two beforehand are the most productive days at work? I always crossed so many things off of my list right before I left for vacation. Well, leaving my job entirely and moving to a foreign country made me productive in all aspects of my life. It was like a cleansing, mentally and physically. Shedding things that I no longer need and having meaningful moments with people I care about. I feel like I have such a strong base now. It’s amazing how being so far away can make you feel closer than ever to the people you love. If you are reading this, you are a part of my base. Sending my love across the big, blue sea.